Avengers: Infinity War – The Avengers (Robert Downey Jr., Chris Hemsworth, Mark Ruffalo, Chris Evans, Scarlett Johansson) team up with the Guardians of the Galaxy (Chris Pratt, Zoe Saldana, Dave Bautista, Vin Diesel, Bradley Cooper) when Thanos (Josh Brolin) goes on a quest to eliminate half the universe. Click here to buy the poster. Bad Samaritan – Sean (Robert Sheehan) and Derek (Carlito Olivero) work as valets. They develop a scam to burglarize the houses of their wealthy customers. When a car is left with them, Derek stands as a lookout while Sean drives to the owner’s house in the car and robs the place. Things go smoothly until he tries to rob a man (David Tennant) and discovers a young woman (Kerry Condon) being held captive in his home. Click here to buy the Blu-ray. 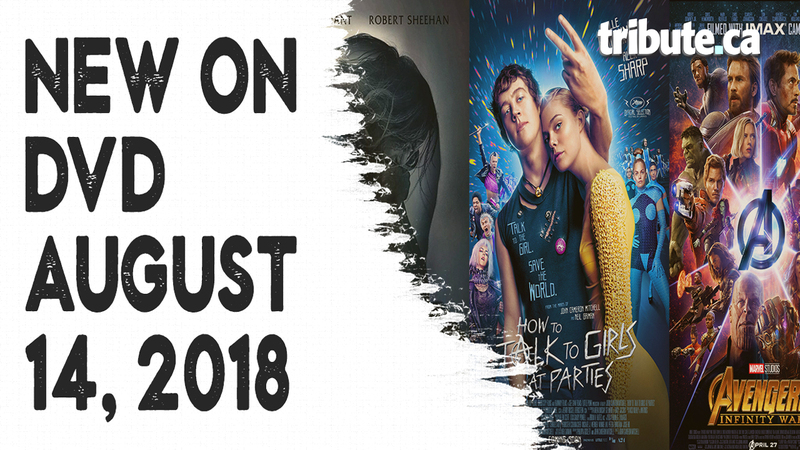 How to Talk to Girls at Parties – When Enn (Alex Sharp) goes to a party hosted by local punk Queen Boadicea (Nicole Kidman), he finds gorgeous foreign exchange students in attendance. He’s instantly attracted to Zan (Elle Fanning). However, the girls are aliens from another galaxy, sent to Earth to prepare for a mysterious rite of passage. When the dark secret behind the rite is revealed, Enn turns to Boadicea and her punk followers for help in order to save Zan’s life. Click here to buy the DVD. Spinning Man – Family man and esteemed college professor Evan Birch (Guy Pearce) becomes a suspect when a female student (Odeya Rush) goes missing. A gruff police detective (Pierce Brosnan) brings Evan in for questioning, not knowing if he’s searching for a kidnapper or a murderer. Click here to buy the DVD. The Yellow Birds – During the Iraq War, soldiers Brandon Bartle (Alden Ehrenreich) and Daniel Murphy (Tye Sheridan) forge a deep bond of friendship. When tragedy strikes the platoon, one soldier must return home to face the hard truth behind the incident, and help a grieving mother (Jennifer Aniston) find peace. Click here to buy the DVD.